Many businesses are still using one-way communication channels like emails that are used without expecting the receiver to ask any follow-up questions about the matter at hand. Conversational marketing is based on two-way communication; one-on-one interactions across multiple channels. It’s the ability to have numerous personalized conversations active simultaneously. This process enables businesses and customers to create relationships because of customer identification. This allows business to improve Customer Experience and customize services for each individual as they have tools to remember each user interaction. "Numerous personalized conversations? I'm sold - show me the solution!" This all can be executed through messaging services, but conversational marketing extends to any two-way communication channel, including phone calls. These days texting is seen as the most natural way to get in touch with someone. Businesses should always assess what their customers’ preferred channel is, and not make automatic choices on their behalf. So what is the difference, or is there any? HubSpot stated the difference well; inbound marketing is a way of attracting customers on platforms they spend their time on. Conversational marketing, on the other hand, is interacting with these customers on these platforms, while giving them control when, where and how they prefer to communicate. To be more specific, inbound marketing is a counterpart to traditional outbound marketing, where products and services are pushed to customers via one-way communication channels like TV, newspaper and radio. Quite old fashioned, right? Inbound is customer-centric while outbound is seller-centric, basically. Outbound is about interrupting people and inbound is about interacting with them. The emphasis here is on the word “with,” and on giving customers actual value in the right context. Therefore, the unanimous win goes to inbound. 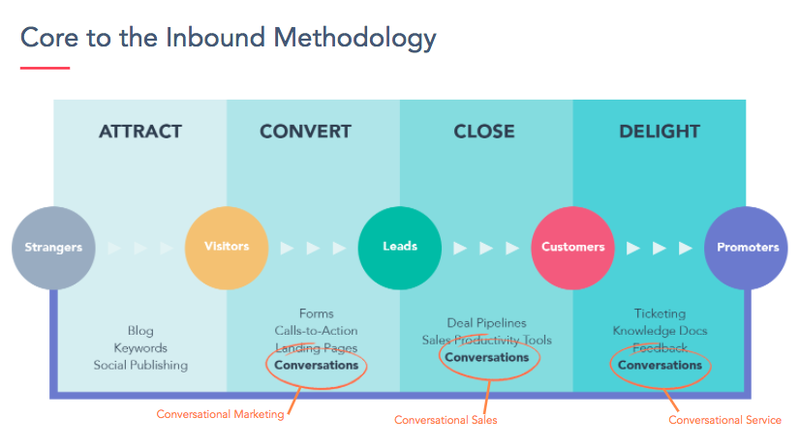 And why do we appreciate Hubspot’s inbound methodology? It's because of the idea of promoters. The real endgame in this business-customer relationship is to make sure that you serve your customers to the extent that they will eventually become promotors of your business. Word of mouth is a powerful tool and can be the focal point when acquiring new customers. Naturally, leads are what businesses are after, and conversational marketing is the key to transform your website visitors to actual leads. Chatbots have made conversational marketing accessible to everyone interested. However, numerous websites are marketing the two solutions, conversational marketing and the chatbots, as the same thing. Sure, chatbots are a part of conversational marketing, like a goalkeeper is in a football team, but you wouldn’t argue that they make up the entire thing. Conversational marketing is a method to change your whole customer interaction spectrum. Conversational marketing is the future of inbound marketing. A bold statement, we know, but here are four reasons why it is actually extremely logical. To make it easy to remember, we call these reasons the 4C’s of conversational marketing - capitalize, capture, convert and create. Shift to conversational marketing requires you to make the necessary leap towards two-way communication channels like live chat, instant messaging apps and chatbots. The change is hard but worth it. Millennials and Generation Z live through messaging apps and the biggest messaging apps have already surpassed the user amount of the biggest social networks. Utilize this platform, and you will gain an advantage over your competitors. As the visitor arrives to your website, qualification happens almost instantly with a simple query e.g. about her/his position. This is how it should be done. Traditional marketing methods, like email marketing, will always lose when it comes to efficiency and time usage. Conversations are easier, more personal, faster and create more information for your company and for your customer. When you have the navigation and chatting history with personal info immediately on your screen when someone wants to chat with you, you have gained the ability to greet your customer like an old friend and start deepen your relationship even further. So are we utilizing these functions - are we a conversational marketer? Yes, we believe we are. Did you recognize yourself in the article and consider yourself one too? If not, you now have the insights to take part in this marketing revolution, and leave competitors who don’t to bite the dust. Interested in reading about customer experience? Check out our whitepaper below!